Home / Bigouden Top 10 ! / Catch a wave ! Surfing is a sport for all ages; “senior surfers” and young hopefuls ride the waves together on the beaches of Pays Bigouden in the shelter of the Bay of Audierne. Surfers from all over Europe travel to the mythical surf spot of La Torche, but there are plenty of other spots to discover ! Surf schools are open to children aged 5 and there is no upper age limit. Through games children learn about the sea, the water temperature, currents, etc. For youngsters, week long courses are a marvellous opportunity to meet enthusiasts from all over France in a friendly atmosphere. There are classes for beginners and experienced surfers too ! Come and try for yourself ! Beginners should not take to the waves without a couple of lessons. Always check the surf, tide and weather conditions before going and, most important of all, be aware of the rules and priorities on the water. 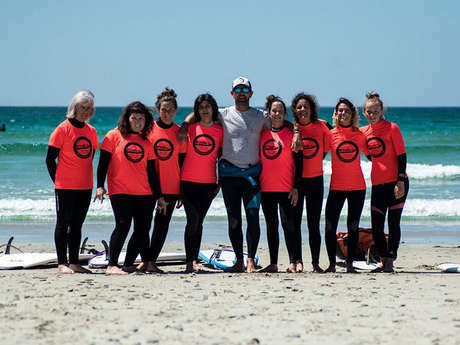 Schools and instructors are on hand to help you to discover surfing safely. Even if surfing is not your cup of tea, it’s always pleasant to watch others riding the waves ! Regular competitions are held throughout the year. Many experienced surfers come back again and again to the mythical surf spots of Pays Bigouden. Pors Carn beach, Penmarc’h is great for surfers of all levels, depending on conditions. La Torche is THE spot to go! The long, dumpy shore breakers are less crumbly than in the south of France and often ideal for longboarding. 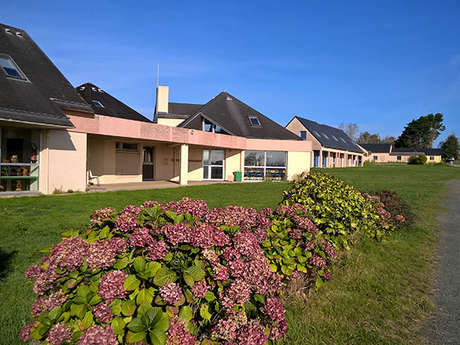 Tronoën, to the north of La Torche, is a spot which often has optimal conditions. The waves are more foamy, and good for learners. Further offshore, beyond the wall, more experienced surfers meet up and make the most of the surf until sunset. Between Tréguennec and Penhors, the surfing conditions are the same as at Tronoën. The waves are just as big and powerful and the spots are less crowded. The campsites and schools close to the surf spots offer services and facilities to meet your needs. Some run a shuttle service to Quimper or Pont l’Abbé. If you arrive by train, the surf schools hire all the necessary equipment. Campsites provide transport to the beach for surfers and equipment and also have facilities for rinsing and drying wetsuits. A thousand and one ways to hit the waves ! 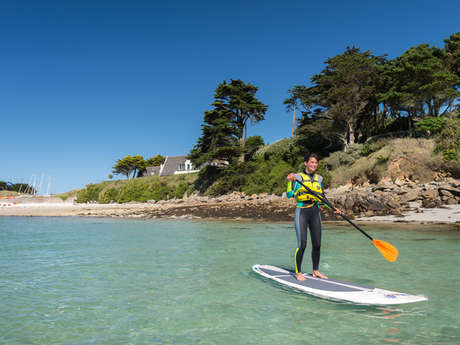 Along the beaches of the Bay, depending on the wind direction and strength, you will also find kitesurfers, bodyboarders and stand-up paddle boarders. The waves of Pays Bigouden are suitable for all types of surf sports. 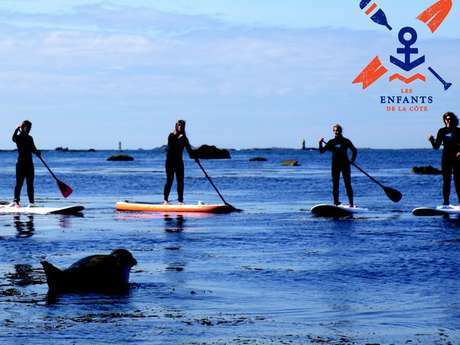 The numerous watersports centres in Pays Bigouden offer a wide range of activities. You don’t need to be a great sporting enthusiast to have fun on the water alone, or with friends and family. Don’t hesitate to visit our Offices de Tourisme. Some staff have tried different surfing activities and can advise and reassure you. Discover Marlène's surfing experience. A few ideas to help you take the plunge ! Try sea wading at Treustel beach, Sainte-Marine. In summer lifeguards are present to look out for your safety. They indicate where there are rip currents, know the tidal coefficients and ask novice and experienced surfers to look out for one another. Please respect the priority rules on the water and take care of yourself and others too. The lifeboat station at Penmarc’h also contributes to surfer safety with its jet-ski “Le Petit Prince”, run by volunteers. Some schools and water sports centres run special sea rescue workshops and courses .